No, not that time of year where you have to pay taxes and/or visit the proctologist. 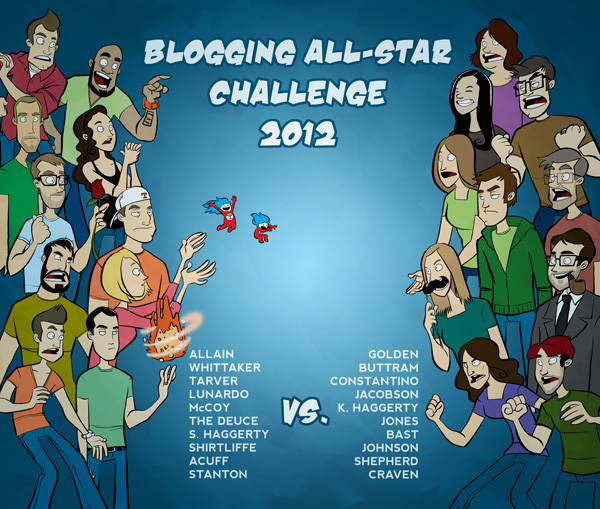 It's time for the 2nd annual Blogging All Star Challenge, where Rob Shepherd and I each pick a team of bloggers and go head-to-head. Check out my team for 2012, and then go vote for them! Tor is a former journalist, author, speaker, husband and father of two girls and one shiny new son, hot off the press. Chad is an IT guru who lives in Arizona with his wife and two kids. He is a contributor to Not Alone, Alise Wright's anthology of living with depression. Jamie is the marketing director for a children and family non-profit. She's also one of the funniest people on the Internet, and slightly obsessed with Nathan Fillian. Monica is Rob's wife. She's the reason he's functional in life. Monica started blogging a few months ago. If you want to see some of Rob's funny stories from another perspective, check out her blog. Amanda is Canadian, but we don't hold it against her. She aspires to be the world's first sit-down comedian. Kevin is an author, husband and soon-to-be father. In fact, he may be a father as you read this. Or this. It's THAT close. Kevin is a rare breed of writing talent - he'll make you laugh, think and be challenged. Renée is a teacher, wife and mother. She's funny and touching. Although not in a creepy way. THE Joseph Craven is a man of mystery. He is currently on an international quest for ice cream. He is also the host of the Courtesy Laugh Podcast. Paul lives in Shanghai with his family. Or maybe it's somebody else's family. It's too far to go fact-check. He produces plays and is a contributor to the Huffington Post. He accepts checks. Jessica is a trophy wife and mother of two. She will make you laugh, cry and laugh while you're crying. She's that good. Today's guest post is from Ken Hagerman. Ken is a missionary in Paraguay. For reasons you won't understand, unless you speak Spanish, Ken goes by The Barba. He blogs here and tweets here. I responded with some ridiculous quip that is nearly, almost totally, based in the truth of our car experiences, and Sir Arthur of 2 Sheds thought it comical. I tell you, tragedy and comedy are sisters in the same dysfunctional family. He threw down the gauntlet of a guest post and, in my machismo, I couldn’t let the challenge pass. What follows is the fallout of that exchange. Being nearly legendary in armchair engineering, I propose the invention of the disposable car. “No need for such a contraption,” you say. I will enlighten you to the gargantuan need for just such an item. I could fill a very sad, very big book with my apocalyptic automobile stories. In 2008, just two days after moving to Paraguay, we purchased a used Mitsubishi Montero, aka the Mission Mobile. It turns out our complete ignorance in Paraguayan business practices would haunt us. Who would have thought? About a year in, the motor in our Mission Mobile defecated its contents next to an empanada stand on Route One. The good news was that a friend’s stepson was the best mechanic in town. The bad news was our town was very small. The worst news was the guy belonged to a cult. I made sure every time I went to check on it that I was well hydrated. I couldn’t risk a Kool-Aid snafu. A disposable car could have spared my family the cost of repairs and the angst of waiting three months to get the Montero back. Yes, it took three months. The first time. The second time the engine went into cardiac arrest, it cost us four months. No matter, it gave me time to track down the reason we still didn’t have a title for the car after 18 months. It had collateral damage. By that I mean, it was used as collateral in three outstanding loans by the previous owner. I can’t blame the guy--he was fleeing the country. He needed money to fund his trip. A disposable car would alleviate this problem by not qualifying as security for a loan, unless you care to buy a sandwich on credit. The third time the Montero’s power plant pooped out was the drive home from picking it up at the repair shop. I towed it to a friend’s house where it still sits today, 14 months later. The good news is that I may get the title for it soon. The loans are paid and the transfer is underway. Four years and counting (Author crosses various body parts for luck). A disposable car wouldn’t have a title, thus saving buyers tons of trouble. Life dictated that we have a car so we bought a little VW Golf to fill the gap. Apparently the original owner was Magneto of X-Men fame. The car has a residual magnetism for other heavy, metal objects. I’ve been hit by a bus three times, by other motorists three times, and we were even sideswiped by a three-wheeled motorcycle once. I avoid the hospital parking lot at all costs for fear of a wheel chair incident. Did I tell you about the first time we rebuilt the Golf’s motor? If the disposable car were a reality this entire story would not exist. We would be liberated from the stress and aggravation of those moments. However, we would also be without God’s provision and deliverance in those things. We would not have seen Him acting on our behalf and for our good. We would not have learned those valuable lessons or understood He is in control in every detail. What new convenience do you want to see invented? How has modern convenience insulated you from God’s interaction? When I was 10, I went to an Albuquerque Dukes (AAA Dodgers farm team, now the Albuquerque Isotopes) game with my grandmother, the biggest baseball fan in the world. They announced that night was Bob Feller Night. He would be signing autographs by the food court. I didn't have a clue who he was, but my grandmother did. She'd watched his entire career and knew he was in the Hall of Fame. He'd won a World Series and was the first Major League ballplayer to volunteer to serve in World War II. Grandmother was as excited as could be. So I grabbed the funny pages from the newspaper my mom was reading during the game (not the biggest baseball fan in the world), and ran downstairs. I waited in line for 45 minutes, missing every pitch in between. There were tables lined up with pictures of him pitching his fastball for the Cleveland Indians. Each picture cost $1, but I didn't have any money. I didn't know it was mandatory. When I got up to him, I handed him my folded-up newspaper. "Hi! Can you sign this for my grandmother?" He tossed it back at me, and barked, "Buy a photo, kid!" People in line started booing. He snatched the newspaper back and signed it (there IS crying in baseball!). I gave the autograph to my grandmother. "I got this for you, Grandmother." She took one look at my face and asked what was wrong. I told her Bob Feller yelled at me. "Then I don't want it." She handed it back to me. I keep that autograph to this day for two reasons. First, it's a great piece of memorabilia to show my son when he grows up. But second, and more importantly, I keep it to remind myself of the lesson my grandmother showed me that day - it's easy to throw away your reputation. Bob Feller spent 20 years earning the respect of people like my grandmother, and 3 seconds tossing that respect away for $1. Maybe Bob Feller was the kindest man in the world. Maybe he just had a bad day; we all do. I don't know. So when you're having a bad day, remember - don't throw it away for something cheap. Has baseball ever made you cry? I can get lost in my own driveway. It doesn't matter if I've been somewhere every day for 50 of the last 10 years; I can get lost on the way. When someone's coming to our house for the first time and they ask for directions, I just hand the phone to my wife. She's a navigational ninja. She uses them big words, like "East". If I'm giving you directions, you'll likely hear "Ok, um, I think you take Main Street for a bit, but then you turn off at the Walgreens...no, maybe it's before the Walgreens, um...are there TWO Walgreens? Never mind, do you know where the Taco Bell is? 'Cause it's just opposite that on the other side of the street facing left. Well, it's left if you're at the entrance, you know? What? Ok, here she is." It's right and left; not East and Whatzit. If Google Maps is incorrect, don't wait up for me. I glaze over and start thinking about squirrels if there's more than three turns. Squirrels don't give good directions. They're nuts. I like snacks on long road trips. Like nuts. Cornuts are the best, but Jana thinks they give me orangutan breath. Anyway, the point of all this is - When you're on your way over, stop at BOTH Walgreen's and pick me up some Cornuts, please. Are you good with directions? If you're a parent, you need to check out a blog I recently ran across - Honest Toddler. While mostly funny and over-the-top, this post about how a kiddo views his dad was one of the best things I've read in a while. Today I'm privileged to be over at Tor Constantino's blog. His family recently welcomed their third child, so he's too busy / tired to blog. Stop by, leave a comment or three, and congratulate Tor! Ooh, that sounded good. Like a robot who's very encouraging...begin narrator's voice..."The Congratulator - you WILL give him a high five!" Bad: I spilled coffee on my phone. Good: It appears to be running faster. Bad: Dealing with tech support from a Federal agency. Also Bad: Dealing with tech support from a Federal agency. Bad: Staying home from work for a day because you're under the weather. More Bad: Getting back the next day to find the number of helpdesk tickets has spiked by 25%. Bad: When your 10-month old son uses both of his two teeth to chew off the end of a power cord. Good: You know your son isn't lazy and likes to see a project through to completion. Don't get your hand near my son, apparently. Can you guess who was watching him when this happened? That's right - Nathan Fillian. When he sees me, he squeals. He kicks his legs and flails his arms. He smiles so big you can see it from space. He's young. Doesn't know much. Doesn't know that I'm winging it as his dad. Doesn't know that my job is tenuous. Doesn't know that I'm selfish. Doesn't know that I'm afraid. But I am his role model. I'll show him how to respond instead of react. I'll show him how to treat a lady. I'll show him how to build others up. I'll show him he can trust God. My son is a blank canvas upon which I get to paint the structures of Life. Growing up, Andy Griffith was a mainstay in our home. While Mayberry had long set sail for Rerun Island, Matlock was in its prime. We would plan our summer mornings around watching it with Mom. We'd try to guess how it ended. Me: Andy Griffith died today. Jana: Oh, no! That's so sad! Wait a minute, which one was he? Me: The Andy Griffith Show? Jana: Oh, duh! Whew, I thought you meant the guy from Matlock. Glad he's still around. Me: Um...he played Matlock, too. Scientists: We found the Higgs Boson particle! Scientists: It's the God particle! It'll explain everything! Normal People: Oh, ok. Um, that's cool. Scientists: You don't understand! This is awesome! Normal People: Will it let you guys finally make us time machines and transporters? Normal People: You're just making stuff up, aren't you? Scientists: Yeah, but we needed funding for our robot projects. What scientific achievements would you be excited about?